Community engagement projects rolled out via a triple helix approach (university/business and industry/government). Service Learning is one of the pillars of CUT’s community engagement. For example, third-year students in Radiography visit high schools to disseminate information related to the availability of medical imaging services in the region and to examinations like mammography, obstetric ultrasound and bone densitometry. Students in Biomedical Technology disseminate information on three very prominent diseases in South Africa: HIV-AIDS, Tuberculosis and Swine flu. Seniors from the Department of Clothing and Fashion train unemployed women from the Kagisanong Township, Bloemfontein in all aspects of sewing by hand and with sewing machines. The aim of this project is to provide food hygiene training for food handlers, managers and children. The project was motivated by research projects conducted by two master’s degree students. They revealed that the individuals tasked with the preparation and serving of food to children do not have the required skills to do so in an effective and acceptable manner, and the current storage practices do not promote food safety. This project is a culmination of many smaller projects which entails the extension and training of consumers, health care facilities, informal vendors, domestic areas and small-scale caterers in the basics of personal hygiene and safe food preparation. This project entails teaching children why it is important to take care of their teeth as well as how to take care of their teeth. 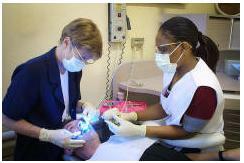 Dental screening is done to determine the dental needs of the children, who then receive the needed dental services. Children, caretakers, teachers, students and service learning facilitators gain a great deal from the interaction between the academic program and the members of the community. Financed by local businesses, Grade 11 and 12 learners are provided additional instruction in Mathematics, Natural Sciences, Life Sciences and English on Saturdays. This enables better preparedness for learners for admission to Science, Engineering and Technology (SET)-related courses in Higher Education; it exposes these students to Engineering-related courses at CUT. Eighty four of the Saturday School pupils are currently enrolled for SET courses at CUT and other HE institutions. The Centre for Rapid Prototyping and Manufacturing (CRPM) offers state-of-the-art equipment to accelerate the manufacturing of products using a variety of additive manufacturing (AM) techniques. This financially self-sustainable activity was established with the assistance of government agencies such as the Technology and Human Resources for Industry Programme (THRIP), the National Research Foundation (NRF) and various industrial partners. These partnerships have played a role in putting the CRPM at the forefront of AM research in South Africa with approximately ten different AM technologies to choose from, depending on a particular project. The CRPM provides a rapid prototyping service to industry, indirectly supporting the South African manufacturing industry. PDTS, as part of the Technology Innovation Agency (TIA), has the necessary facilities to provide technological support to small, medium and micro enterprises (SMEs) and private individuals seeking to design and manufacture first-generation prototypes of new products in view of possible manufacturing in South Africa. The PDTS has links with various companies in the manufacturing industry, and each project is evaluated to determine viability before execution. The client is assured of professional assistance every step of the way in the development process. Technical and new product development skills transfer to employees in industry is of key importance in this programme.